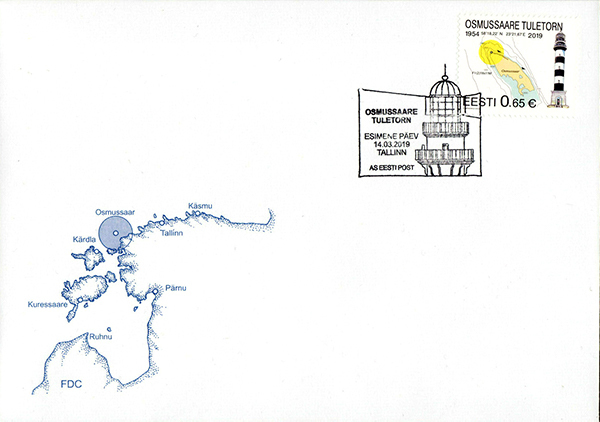 On 7 June 2018 Eesti Post issued the latest in its long series of lighthouse stamps. 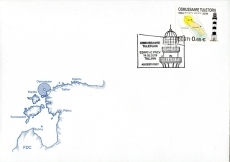 This years stamp issue features Manilaiu Lighthouse which is located at the western entrance to Pärnu Bay in the northeastern part of the Gulf of Riga. The “beach ball” surrounding the location of the beacon shows the light sectors for this lighthouse. Light sectors are used to mark safe and dangerous areas and navigable channels. This light is interesting in that it shows seven sectors which is an unusually high number. The sectors are made by placing colored filters around the lantern. When in a red sector, when viewed from sea, care must be taken as red marks a dangerous area. Marking channels using light sectors is normally done where it is not practical to use range lights which are more precise.